Note: In March, President Trump blocked what would have been the largest merger ever between two technology companies, Broadcom and Qualcomm. The president cited “national security,” but kept most of the details classified. Today, we are going to reveal the true reason for the blocked merger… and shows how one piece of technology could secure America’s economic dominance for decades. Over the years, these wireless networks – and the infrastructure that supports them – have evolved. It all started in the 1980s with first-generation (1G) networks. Compared to what’s possible today, it didn’t allow much. You could only place voice calls – there was no layer for carrying other types of data. And you had to use one of those brick-sized cell phones Gordon Gekko yaps into in the movie Wall Street. But from then on, a new network generation went live roughly every 10 years. Each provided faster download speeds and more applications. The most recent one, 4G, went live around 2011. Now we’re shifting to the fifth generation of wireless networks – 5G. And it represents the largest leap in wireless technology to date. Right now, the government’s fear is that China will set the 5G precedent. The U.S. government sees it as an imperative that U.S. wireless networks are built out quickly – with U.S. and European technology – to ensure that the country’s networks are less likely to fall victim to foreign espionage. You see, while Broadcom recently stated its intention to bring most of its business back to the U.S., the bulk of its business is still based in Singapore. And while Singapore is its own country, it’s heavily controlled by Chinese Singaporeans. The concern was that Broadcom would force Qualcomm to cut back on its research and development into 5G, letting Huawei fill the void and making U.S. wireless networks vulnerable to cyberspying. The Committee on Foreign Investment in the United States, a government agency that oversees foreign investment in American companies, specifically mentioned the threat posed by Huawei in the 5G space when officially recommending the blocking of the Broadcom/Qualcomm merger. In January of this year, leaked White House documents showed that the U.S. government was considering nationalizing the 5G network buildout – in other words, seizing control of wireless networks from AT&T, Verizon, and other service providers… and putting them in the hands of the government. Verizon and AT&T – along with T-Mobile and Sprint, which are in the process of merging – are already building out 5G networks. And T-Mobile – the third-largest mobile communications provider in the U.S. – says it will be launching in 30 cities before 2018 is over. For 4G, it took about 200,000 cell towers to build out a nationwide network. A 5G network buildout will require around 1,000,000 cell towers – a 5x increase. When all is said and done, there will be a 5G tower on nearly every street corner. 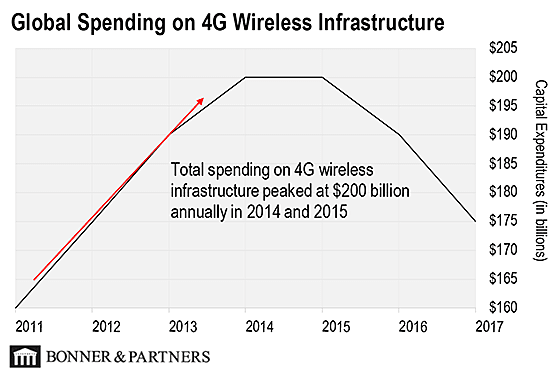 Spending on the 4G wireless infrastructure hit about $200 billion a year at its peak. I expect 5G infrastructure spending will hit a peak of $275 billion and will require a minimum of $200 billion annual spending through 2025. The chart below shows the performance of AMT from 2011, when the 4G buildout started, to present. 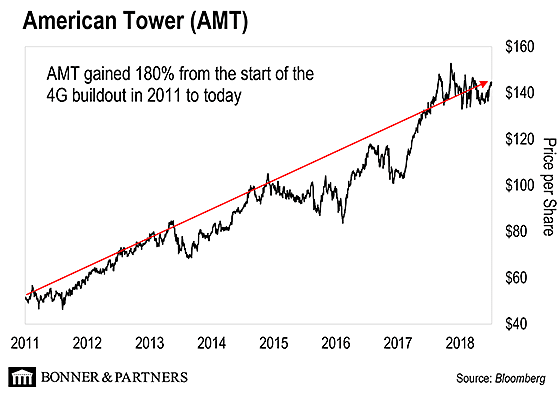 I expect American Tower will continue to climb as the 5G infrastructure buildout continues.